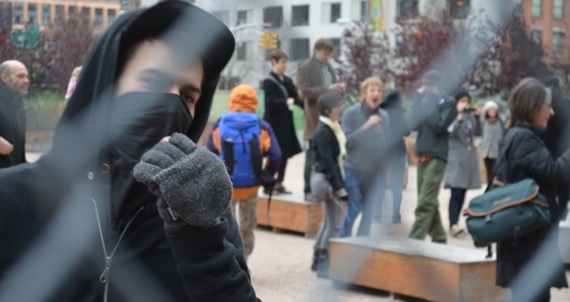 The short-lived occupation of Duarte Square in New York City on December 17, 2011. I’ve lately been getting the feeling that Occupy Wall Street’s past successes are starting to go to the heads of some people in the movement. There were, of course, the glory days of Liberty Plaza, and now also the spurt of momentum during and following the brief March 17 six-month-anniversary reoccupation there. But as the NYPD and police departments across the country make it quite clear that occupations of any kind will not be tolerated, the mood has gotten sour. The good old days, it seems, are not coming back. For lots of organizers, I’ve noticed, the operating presumption is that occupation — something comparable to last fall but somehow surely better — constitutes a prerequisite to further political action. Consequently, a considerable amount of the energy of the most talented organizers in New York (as well as, evidently, in Oakland and San Francisco) has been directed toward failed reoccupation attempts. Or else the movement is celebrating its own anniversaries, not making occasions for new ones. The more conversations I have with listless, frustrated organizers, though, the more I start to feel that right now this occupation-first logic is exactly backwards. This is a new time; the movement and people’s perspectives on it are in a totally different place than they were last fall. Potential allies expect more from the movement, I’d say, and so they should. People I know who were wholeheartedly behind it a few months ago seem to think it’s over, or it should be. The encampments, which Occupiers know as well as anyone sometimes turned into rather unsafe spaces, lost much public support. YouTube clips and statistics of Occupiers behaving badly in them have become fodder for a right-wing smear campaign that is gearing up for any possible resurgence. This matters; in some sense, an occupation must always be earned with public support, support which makes the cost in legitimacy too high for the state to mount an eviction. Remember the early morning that so many remember as the climax of OWS’s whole story? It was October 14, when thousands of people turned out before dawn to keep the paws of Mayor Bloomberg’s cleaning crews off of the park. The moment those crews were routed, when the announcement came to everyone through the people’s mic — that was amazing. But it took a lot of committed allies to make it happen, beyond the usual characters you’d see around all the time. And right now, apparently, that support simply isn’t there, because evictions keep happening and there isn’t much of an outcry. So how can the movement recapture that support? How can it, even more than before, light up people’s imaginations and make them want it to stick around? Here’s a modest proposal (modest because this is not a movement that tends to take or need advice): Challenge the power that affects lots and lots of people’s lives. Right now, there are a bunch of smart projects starting up in the movement, each addressing core issues directly related to why so many thousands of people began Occupying Wall Street to begin with. There’s Fight BAC, a project with the (not at all modest) goal of taking down Bank of America. There’s the effort to fight foreclosures and evictions through occupations, auction blockades or eviction defense. There are groups like Disrupt Dirty Power aimed at finally halting the corporate machine that’s driving climate change. How about a massive student debt strike? All of these are already in the works in the Occupy movement, but they tend to attract relatively small numbers of people compared to re-occupation attempts and rowdy marches. What if these, for a while, were the main business of the movement and the main outlet of its huge creativity? What if the first thing people thought of when they heard the word “Occupy” was, “Oh, those are the kids trying to take down the most dangerous bank in America and who saved my friend’s home from foreclosure”? Do stuff like this, and you’re creating a dilemma for the whole society. You’re asking everyone to choose sides — not about a little occupation, but about major features of everyday economic life. Do I want Bank of America to foreclose on my neighbor or not? Do I want my kids to spend their post-college lives enslaved by debt or not? These are serious political questions, which will easily eviscerate the nonsense the presidential candidates keep spouting on the news. Suddenly the question of letting the movement have an occupation somewhere seems comparatively small. In the meantime, and in the process, it’s hugely important to keep the spirit of occupation alive — though not necessarily in tents. Union Square in New York is serving that purpose right now (especially when Occupiers there sleep on sidewalks in front of banks), as are the occasional afternoon Occupy Town Square events. May Day might be a great moment for rallying along these lines. This sort of thing is really important, because it’s constructive rather than just disruptive, and it points the way toward a new, revolutionary society. Lots of people in the movement talk about wanting to see these occupations eventually evolve into sustainable worker cooperatives and serious, large-scale mutual aid networks. But what if it were all in the context of making unmistakable the most egregious, fundamental crises in the fabric of our society — in the banks, in the schools, in politics, in how we treat our planet? Compared to those sorts of things, I bet, encampments in parks will seem like no big deal. Maybe the movement might even start getting them again without really trying. At the very least, there will be a whole lot more people standing up against the forces of repression for the right to occupy. Hey, they’ll say, we’re changing the world with this movement — why not let it have a park or a building somewhere if we can do some good with it? I am not sure why the author feels that a reoccupation and targeted direct actions are mutually exclusive activities. Furthermore, a standard response by the powerful to dissent and disruption is the attempt to discredit the challenger. While gaining public favor should be one small goal of the Occupy movement, most members understand that staying on message is critical. OWS has done that–refused to be diverted from its core objectives: fighting for social and economic justice. The public will gradually become less skeptical as more people begin to feel the pain of austerity regardless of what OWS does or does not do. However, OWS might be instrumental in providing a viable alternative to despair–the tools for self-empowerment–if it doesn’t let concerns about public image distract its members from doing REAL, substantive work. Lastly, your article sounds like that of a person who should be deeply grateful he is not homeless. What might your feelings about reoccupation be if you did not have a home to return to each night? Thanks for raising these important points. I am deeply grateful that I’m not homeless; however, I’m not sure that OWS is really doing a great service to the homeless population in the short term by increasing the militarization of the places that they might otherwise peacefully sleep. I also have serious concerns about situations like the Occupy SF’s attempt to occupy a Catholic building for a new community center. If this movement is about providing short-term charity, it would be seriously hard-pressed to do better than Catholic Charities, one of the largest and most efficient service-providing systems in the world. If the movement is really serious about structural change, however, that’s a different matter. I do agree that assuaging public opinion should not be the sole objective of the movement. Perhaps I overstated that. For me, the real crux of the issue is not whether it’s making everyone like the movement (since people rarely like what’s good for them), but whether it is posing meaningful, important, relevant dilemmas to large swaths of society. Right now, the question of occupation only affects the few dozen or hundred people who might actually participate in it. What the movement needs to do is force people to take sides in much larger numbers, on much more important issues. Otherwise, people can get away with not caring, and instead letting themselves be glued to the absurd presidential election. Occupying a space does what? It was a good start. Not all occupy groups have camps. Staying in one location doesn’t spread the word or do much with the numbers they have. Rigidity of structure with a hierarchy out West told me I’m not welcome. I’ll not give up, but a bigger city out here, also has no room for alternate thinking. Sticking to a theme is one thing, not thinking of alternate ways of attacking the same target is unwise, and counter-productive, precisely because people get driven away. Repeating the same organizational models, which they do despite notions otherwise, is not progress. Rejecting people because they are different, is unwise. By not re-directing their efforts to the true target, the Federal government, by not establishing a sound base of operations at the county level, I’m not sure they are designed to do much on their own. If economic conditions worsen, or if further draconian decrees emanate from above, their numbers might then grow. Protest groups need pissed off people to swell the ranks. Most Americans accept their decline as though it’s just a natural cycle of life. They accepted Congress deregulating to create economic anarchy. They accept the near everywhere surveillance and don’t mind strangers looking into all of their body openings. As long as people only get concerned when directly affected, the numbers will not be enough to be effective. Individualism keeps people apart, and it’s selfish. A free people with self-government needs everyone to maintain the system, which they do in the area of helping the government maintain its un-natural rule over us. What most of my fellow Americans don’t do is to maintain their own healthy respect in themselves as they reject their role to help return government back as our servants. My fellow Americans are happy being told what to do and when to do it. in other words, the uprising is a TAZ.